Hey Everyone! As you can see, I am participating in a blog tour organised by Smith Publicity for the book, The Measurements of Decay. 1. What inspired you to write The Measurements of Decay? 2. What are some of the themes readers can expect to discover in The Measurements of Decay? At the most general level, the core themes revolve around and arise from the abstract issues I described above. These ideas are very abstract sounding, but I think most people are familiar with them at some level. I have endeavored to test a lot of ideas, push them to their limit, and see what the result is. For me, that is the heart of science fiction, the power to speculate to extremity. There is an old saying in French, which can be translated as: “To understand all is to forgive all.” In great part, the novel is an analysis of that idea. What would it take for us to completely understand each other, and therefore forgive each other perfectly? Wouldn’t that be an ideal scenario? To understand each other so well that we treat each other exactly the way we would treat ourselves? Ok. So what would it take? What would constitute perfect understanding? You would have to know the entire history of the person, objectively, the way a scientist might describe their whole life in a lab report. It would require knowing all of their inner thoughts, too––their subjective life. All the reasons they gave themselves for their actions. All of their ideas, emotions and experiences, the way they experience the world–––plus, you would also need their whole context, so you would need to know entire history of the world. So it’s impossible. Right. But not in science fiction… or is it? Piggybacking off of the theme of empathy and understanding, the theme of evil is core to the novel. Aside from classic moral questions such as: “Do the ends justify the means?” “Do consequences or principles dictate morality?” “What defines a Good Life?” and so on, I wanted to explore the theme of evil in relation to understanding and forgiveness. What are the limits of forgiveness? Let’s say you can understand everything about a person, but they have committed some truly reprehensible acts… can you forgive them? Can you forgive Hitler, after experiencing the whole of his life and understanding perfectly what led him to his decisions? You might say no, but consider that to understand his life the way he understood it, to be in the cockpit of Hitler’s life, so to speak, you might not have a choice but to commit the same acts he did. Although perhaps not, depending on what we build into the thought experiment. Many people loath themselves, of course, but maybe they don’t fully understand themselves. It can get quite tricky. The novel takes that French proverb to its limit and tests it. We have a character who, by the same token that he recognizes all of the epistemological, metaphysical, ontological and moral issues at stake, is as vile, immoral, and contemptible as it gets preciselyin virtue of his knowledge. That is the real question for the reader. How much can you stomach? How much are you willing to forgive, knowing a maximal amount about a person? And if you can’t, then is understanding the key after all? Can evil survive both total knowledge and forgiveness? There is a nice discussion of the limits of forgiveness in Dostoevsky’s The Brothers Karamazov, in Book V Chapter 4: Rebellion, for anyone interested. What do we know best? Most would probably say ourselves, since we are most familiar with ourselves. Ok. So should that be a model or standard for the extent to which we would like to understand others? That understanding others as well as we understand ourselves would be the highest achievement of understanding? There are obviously problems with being able to understand things other than yourself. You are separated by time and space from literally everything exterior to you, and experience them by way of a limited perspective. You can’t have a God’s-eye-view of things. You cannot know the thoughts of others, etc., etc. But what about yourself? Your thoughts are subject to time. Your body is distinct from your mind. Insofar as you are divisible in any way, you are not a self-contained totality. You participate in the world. So that problem folds into the greater problem of knowledge. There is a lot in the news these days about identity. I think that’s a candidate for the successor to the age of information––the age of identity. That, in a way, is part of what I wanted to bring to its logical conclusion by way of science fiction. In the novel, metempsies allow you forget your identity, and experience existence, virtually, as another person, another identity––but mediated through your own self. It’s a bit loopy, structurally. It’s the dream of many people today, to be able to wholly construct your own identity to the point where its artifice (the creation of it) does not intrude upon its perceived authenticity. I think it may also be the logical conclusion to storytelling, the way we get invested in characters, sympathize with avatars. Video games and movies push that avatar-sympathizing further. What’s next? How can we become Iron Man, Captain Ahab, or Harry Potter, and thereby experience their story as they do, as opposed to mere observers? Would it still be a story? There are many battles in philosophy around what is called epistemology––the study of knowledge. There are many opposing traditions, theories and systems out there, so while the novel doesn’t cover them all, it does cover what I consider to be two big, opposing categories. One view says negativity is a part of the truth, the other view says that the truth must exclude negativity. For instance, is a true view of a chair one that covers all of its angles? Or is it an inherent part of a true perception of a chair that we cannot view it from all angles at once? For those interested, this issue is related to the conflict between Hegelian and Aristotelian logic. Dovetailing with the philosophical problems the Narrator is facing, the novel depicts a society that has tried ways put a band-aid on these issues. In many ways, the society of the future described in the novel is a logically extreme conclusion to the societies we live in today. That is, one structured around silent A.I. and smart phone-like technology, but motivated by the underlying philosophical problems we face. Our phones already feel like extensions of ourselves. It’s only a matter of time before they are permanently fused to our minds. What will that look like? How will that relate to the problems of consciousness, language, communication, thought, and human interaction? How about entertainment? Fantasy and dreams are core components of the human psyche. What will they look like, structured by such technology? The principal means by which we communicate with others is language. We tend to see language as an invisible medium, a clear window to our thoughts, and to those of others. But language is a part of our thoughts. It is a part of that which it helps us to access. It thereby frequently obscures and complicates just as much as it clarifies, at every level, from philosophical theorizing to interpersonal conflicts. We misunderstand each other and talk past each other frequently as a result of language, and not simply in spite of it. The theme of language in the novel also comes out to a large extent in the question of whether or in what way our thoughts and sentiments are truly separate from language. Do I have thoughts first, which are subsequently expressed in language? Or are all my thoughts necessarily linguistic? If not, what does that look like? What is a non-linguistic thought? The tension between poetry and logic as media for truth is another theme that is very inherent to the novel, precisely because of the style I have chosen. Plato suggests in the Republic that poets should be outcast from the ideal society. There’s a reason he, a philosopher, brings that issue to the table. If poetry is indeed the language of emotion, then does it obscure our rational understanding? How does poetry, if at all, deliver truth? The novel’s narrator is as much a poet as he is a philosopher. Why is that? What are the tensions that arise for him as a result? 3. What advice would you give readers interested in reading The Measurements of Decay? How should they approach the novel? The reader should approach The Measurements of Decay with a degree of patience. I have written the novel in an ornate style that bucks the minimalist trend. That alone means paying more attention to the language and not racing through the plot, which is itself somewhat complicated and tangled in other aspects of the writing. The reason for this is that the language is itself a key part of the story, for philosophical, thematic and character reasons. The overarching plot, meanwhile, unravels quite slowly. Many readers have expressed that they found themselves having to accept a degree of ambiguity through the first half or so, but being enthralled by the plot thereafter and appreciating the upward climb retroactively. In addition, the philosophical content of the book can be quite intense, especially for someone without a background in the subject, though not, I think, impossible. Lastly, I would say that the reader should treat the Narrator as a character with his own idiosyncratic worldview, use of language and will. Much of the novel is an exploration of his psyche, his evil, and his philosophical troubles. To understand the novel is to attempt to understand the Narrator. 4. Who are your favorite authors you like to read and/or follow? 5. When do you find the time to write? 6. Who and/or what has influenced your writing style? I am attracted to beautiful and daring language, intellectual ideas and poignant characterization. The novels that I enjoy the most tend to be ornately written, poetic and philosophical in some degree. I have ideas for three more novels, each very different from the other, and different to The Measurements of Decay. I am also focusing very much on my professional career and my personal life, with much less time for writing, at the moment. K. K. Edin was born in New York and grew up in the UK, France and parts of the Middle East. He holds a Bachelor of Arts degree in Philosophy and Political Science and a Masters in Philosophy from Boston University. He currently lives in Boston and The Measurements of Decay is his debut novel. Find K.K. Edin on Facebook, Twitter, Goodreads, and at www.kkedin.com. 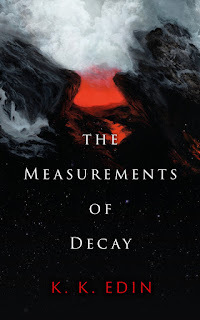 The Measurements of Decay [Metempsy Publications] is now available in hardback, paperback and e-book formats on Amazon.